Beets are best known for their bright red hue and bevy of nutrients. But the root vegetable also grows in a variety of colors that can range from yellow to banded red and white. While most people know that the flesh of the beet can be eaten — dried, pickled, roasted or raw, to name a few preparations — the leaves are also edible as a salad green. Not only can you eat raw beet flesh — or try it dried, pickled, roasted or juiced — but beet leaves are also edible as a salad green. What Parts of Beets Can You Eat Raw? Both the leaves and the root of beets are edible. Despite lingering myths, raw beetroot isn't poisonous, not even to animals. Beetroot leaves are most similar in flavor to chard or spinach, with a slightly bitter flavor, and are commonly used as a salad green or sautéed like spinach. The root portion of beets, however, is very sweet. In order to mitigate this sweetness, beetroot is commonly cooked or pickled. Raw beetroot is the most nutritious form of this vegetable. The more heat is applied, the fewer antioxidants and nutrients are retained. This is the case for other food processing techniques as well. A 2016 study in the Journal of Current Research in Nutrition and Food Science showed that beets typically lose nutrients, with the exception of vitamin C, when pickled. Raw beetroots and beetroot juice contain the most antioxidants and nutrients. Beets are a particularly good source of folate, manganese and potassium. Raw beets can be a delicious way to add a bit of crunch and color to your meal. Raw beets can be peeled and grated and used to make pink variations of coleslaw or incorporated into salads. A popular way to eat raw beets is to make them into smoothies with antioxidant-rich fruits, like raspberries and blueberries. You can also juice beets whole (skin and all!) along with sweet and spicy foods, like apple and ginger, to make tasty beverages. Looking for some creative ways to incorporate beets into your cooking? Try one of these recipes. 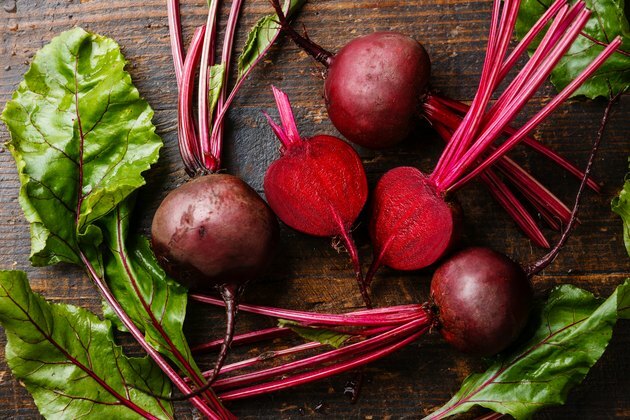 Eating raw beets has been associated with a wide range of benefits, such as potentially improving the performance of athletes, particularly in environments with low oxygen levels. A 2013 study in the Journal of the American College of Sports Medicine showed that beetroot juice enhanced cycling performance in simulated altitude conditions. A 2015 study in the Journal of Sport Nutrition and Exercise Metabolism showed that beetroot juice also improved the performance of national and international-level kayakers. A 2012 study in the Journal of the Academy of Nutrition and Dietetics showed that eating a whole, baked beetroot could improve running performance. Additionally, several studies, including a 2012 study in the Nutrition Journal, a 2012 study in the British Journal of Nutrition and 2016 study in the Journal of the American College of Cardiology: Heart Failure have shown that beetroot juice can lower blood pressure. This is the case for both healthy people and those with a history of heart problems. And according to a 2015 review of the health benefits of beetroot in the Journal of Nutrients, red beetroot has been linked to improved cardiac function and reduced inflammation. Beetroot may be able to impact a wide range of diseases, including atherosclerosis, dementia, diabetes and hypertension.